One of the many ways by which bacteria control gene expression is through cis-acting regulatory mRNA elements called riboswitches. By specifically binding to small molecules or metabolites and pairing the binding event to an RNA structure change, riboswitches link a metabolic input to a transcriptional or translational output. 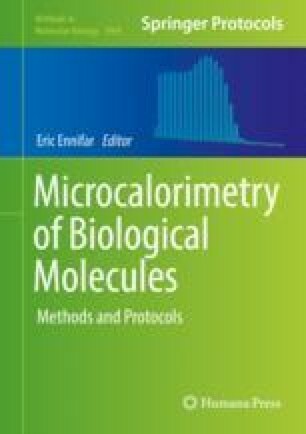 For over a decade, isothermal titration calorimetry (ITC) has been used to investigate how riboswitches interact with small molecules. We present methods for assaying RNA-ligand interactions using ITC and analyzing resulting data to estimate thermodynamic parameters associated with binding. We thank S. Bachas, M. Chen, N. Demeshkina, C. Fagan, T. Numata, Lj. Sjekloca, and R. Trachman III for helpful discussions. This work was partially supported by the intramural program of the NHLBI, NIH, and by a Lenfant Biomedical Fellowship to C.P.J.